The Sugarloaf Club started coming together in 1948.”The Maine Ski Council, a group of enthusiastic skiers from a few existing ski clubs, wanted to promote skiing in Maine. We went to the state and said, ‘Let’s follow what they are doing in New Hampshire,’ ” said Robert “Bunny” Bass of the G.H. Bass boots family. 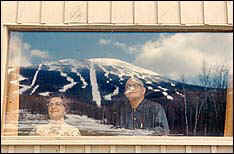 Thus the Sugarloaf Ski Club was launched in the summer of 1950. 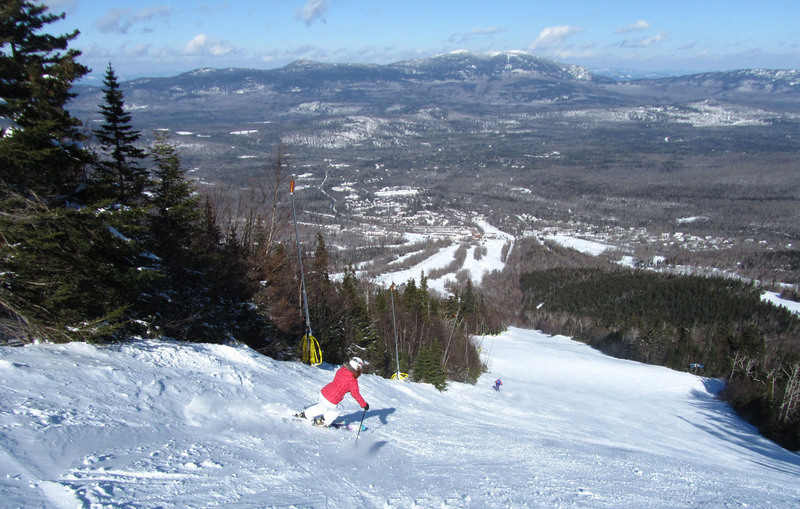 Its impact on Maine skiing – and Maine sports – has been profound. 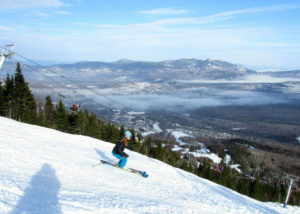 Today Sugarloaf boasts 126 trails covering 45 miles and 1,350 acres, and slopeside lodging for 7,800 skiers. It is generally considered to be – although some other slopes’ devotees would argue – Maine’s premier ski mountain and resort. And it traces its roots to 1950, when energetic club volunteers dedicated their spare moments that summer and fall hacking away at the well-pitched wilderness on Sugarloaf. 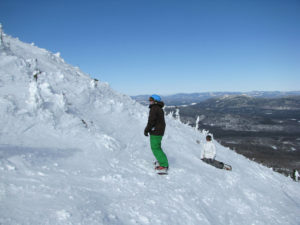 Even early on, the diehard skiers were delighted with their new terrain. Sugarloaf’s unmatched attributes included a broad face with ideal northern exposure, and plenty of snowfall. The above-timberline snowfields meant no need for clearing on the summit. 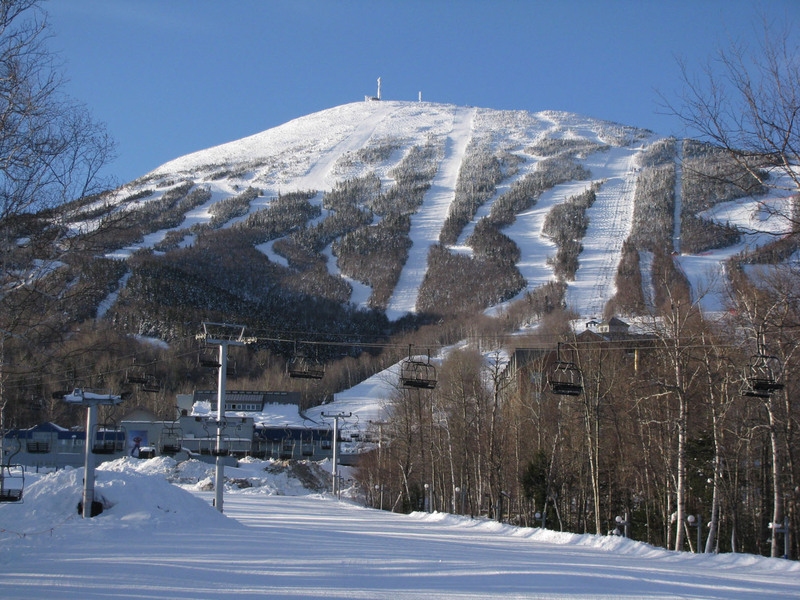 Sugarloaf’s first ski trail was cleared in time for the snowy winter of 1950. It was named “Winter’s Way,” in honor of Amos, the storekeeper. The trail was built with help from a nationally recognized ski trail carver, Sel Hannah. It was 50 to 75 feet wide, descending from the snowfields for 1 twisting miles. Skiers hiked and skinned up for snow that lasted until May that inaugural season. The hardy Sugarloaf Ski Club was off and running, with 30 members each contributing $10. “We didn’t really have a race course that year. The trail still needed work,” said Bunny Bass. More summer trail widening and clearing improved the trail for the next winter, but the two-mile path from where cars could park was still a harsh reality for the intrepid skiers. Winter, the eternal optimist, already was eager to host a race. “Amos Winter contacted my father, Ted, who was the University of Maine ski coach. 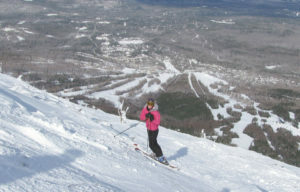 Amos was hoping to organize a race that would demonstrate to the ski world Sugarloaf’s potential,” said Edith Curtis, another of the Sugarloaf pioneers. The first Schuss On April 6, 1952, Winter realized his dream: The first Sugarloaf Schuss was held. “We hoofed it for two miles to reach the bottom of the race course,” said Ted Hawkins, who won that first Schuss race. Winter supplied sandwiches to the 54 racers on that freezing, densely clouded day. Wes Marco, race chairman and certified course-setter, laid out that initial race course on “Winter’s Way.” After running out of borrowed poles for gates, Marco trimmed a few spruce trees and stuck them firmly in position. He knew certain gate crashers, like Bob Irish and Grady Erickson, would have him to thank for their raw knuckles. Bass remembers the telephone wire that was lugged from the finish of the course to the top. The “5-4-3-2-1-go” start was announced, and the three stopwatches were clicked on. “With three timers, we could check each other to give the racers a fair time,” Bass said. The state-of-the-art equipment included long wooden skis with bear-trap leather bindings, which freed skiers’ heels for climbing. The race bibs were hand-sewn by some wives. A few industrious racers dripped candle wax on their ski bases. Edith Curtis said of her first-place women’s run, “It was so foggy that day you could not see from one gate to the next. But that wasn’t his first run at the Loaf. He was part of the 1948 crew that skied the snowfields and through the trees, with Winter scouting what would later become Sugarloaf’s 1,400 acres of modern skiing terrain. The summer of 1952 brought more trail pruning, work on what was a muddy access road, and the completion of the first club hut. Statewide praise Statewide, Sugarloaf was being noticed, its potential coming into focus. Automation hit in the winter of 1953-54. The first lift, a portable, 10-horsepower rope tow, provided uphill transport for $1 a day for non-ski club members. 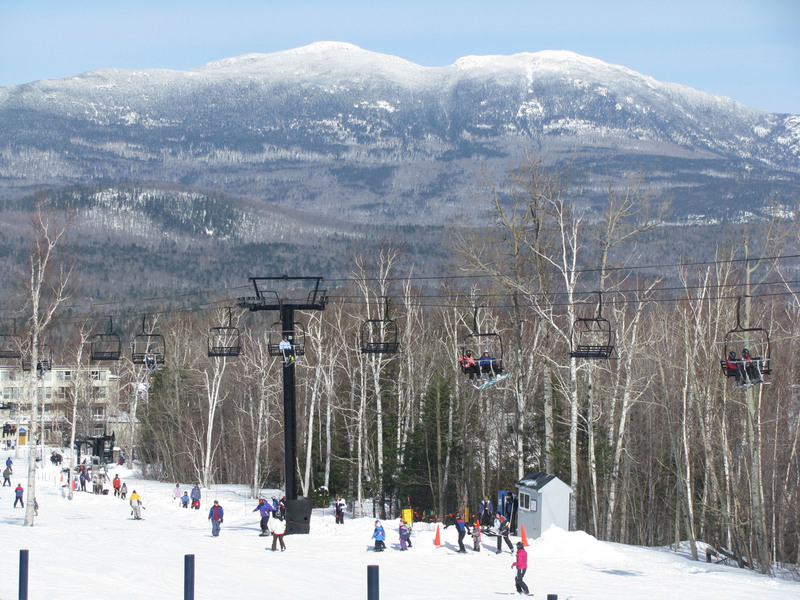 Stub Taylor said, “When the ski club put in the rope tow, I became Sugarloaf’s first lift operator. If someone got hurt I was there to help out. I had Boy Scout first-aid training, so that made me the first patroller too. In 1955 the newly formed Mountain Corp. issued $100,000 in common stock at $10 a share. The ski club was granted 1,000 shares. 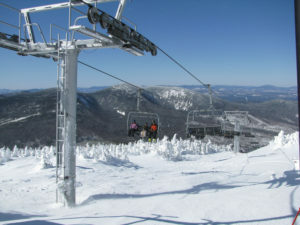 Winter and his crew installed a 3,575-foot T-bar that cost $42,500. The now world-famous racing trail, “Narrow Gauge,” was designed along that 878-foot vertical rise. That winter’s business realized a profit. The board reinvested in a second T-bar, a first Snow-Cat with rollers, and lodge improvements for the following season. Taylor remembers the clearing of every Sugarloaf trail, with particular fond memories of trekking up and down the “Tote” with an Olympic skier, Brooks Dodge. The Austrian ski instructor Werner Rothbacher came to Sugarloaf in 1957, commencing an ambitious racing program and bringing competitive skiing to the area. Sugarloaf hosted its first of what would become a tradition of national Alpine championships. Overwhelming turnout The 1958, end-of-season Schuss race was the largest ever. The up-hill capacity was overwhelmed, pointing to a need for more lifts and trails. The ’60s brought rapid growth for Sugarloaf. The first lodging, the Capricorn, opened in 1963 and is now the home of Carrabasset Valley Academy. In 1966 the 8,430-foot gondola took flight, carrying skiers to the snowfields until 1996. 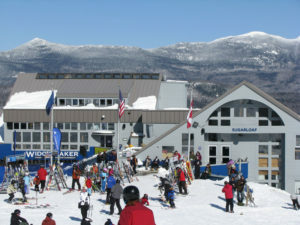 The original gondola base now serves as the competition center and meeting place for the ski club. 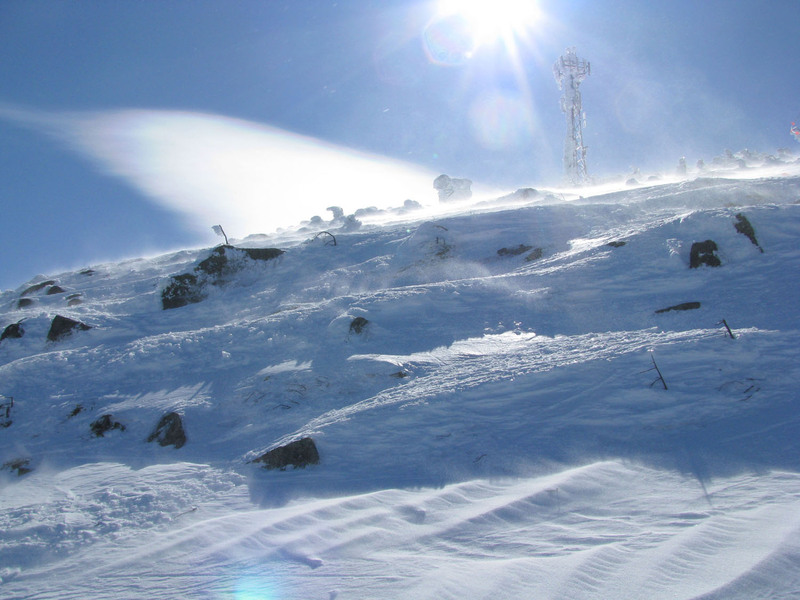 The 1970s began with the introduction of snow-making and continued lift improvements. 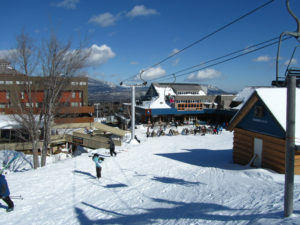 Sugarloaf hosted its first World Cup event in 1971. 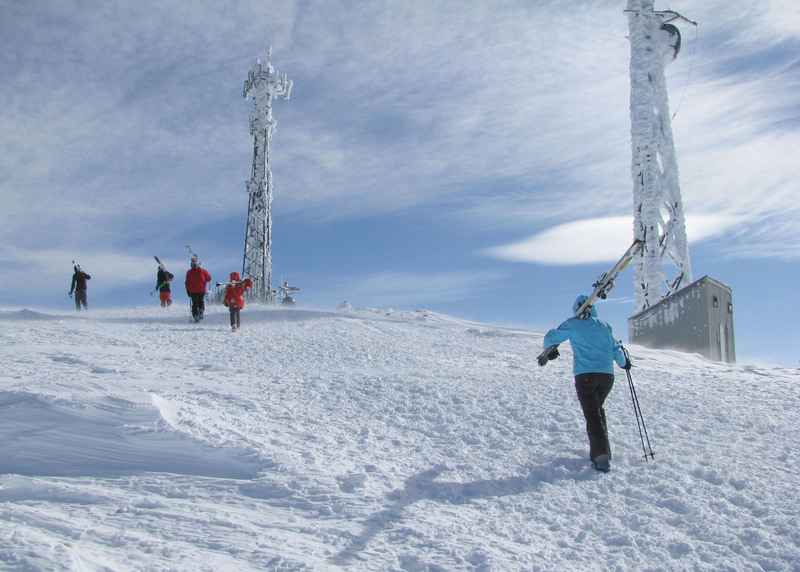 By the ’80s Sugarloaf had grown and skiers were coming in droves to explore the mountain. Sugarloaf’s reputation for on-mountain lodging spread, and new condos popped up like moguls in springtime. Flash forward to the 90s, Sugarloaf/USA is part of Les Otten’s American Skiing Co., a company that owns nine resorts from California to Maine. Then in 2007 Sugarloaf was purchased by Boyne along with sister Sunday River, after ASC dissolved. 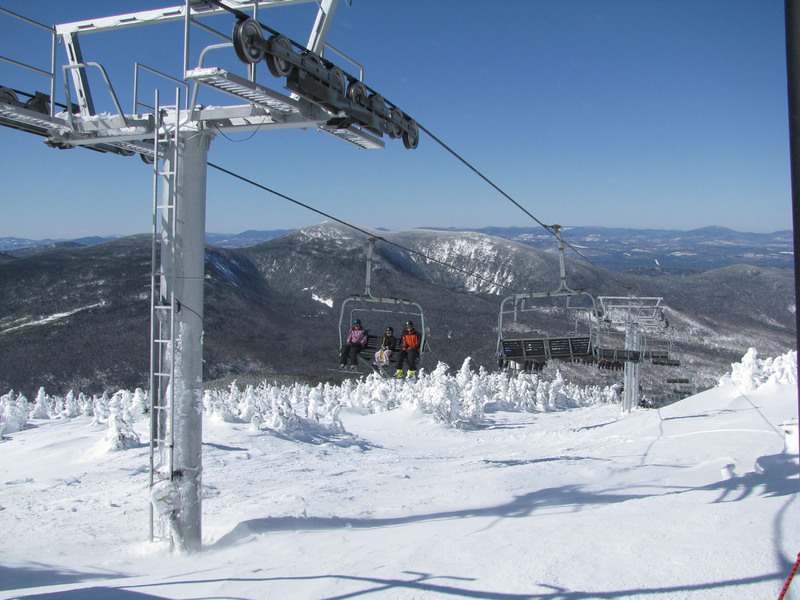 The history of the mountain and the 50+ year-old ski club isn’t just appreciated – it’s credited with Sugarloaf being the attraction it is. The Schuss race has changed over the years. It moved from its first trail, “Winter’s Way,” to “Narrow Gauge.” The race even was held on “Tote Road” as a downhill event one year. It has been canceled only twice in 48 years – in 1967 due to a snow drought, and in 1969 due to an overabundance. The ski club, now with more than 1,200 members, has played a leading role in creating Sugarloaf and fostering its racing success. “There has been a dramatic change in competitive racing from weekend races to week-long national events, but the club still provides all the volunteers,” said Greg Foster, club president from 1995-1999. “Socially it has always been about people coming together with a common interest. At every event the memories are re-installed. “Schussers” don their vintage garb and ski in a ceremonial re-enactment of that first race, paying tribute to the Sugarloaf heritage. Edith Curtis said she had to search her closets for her “old ski stuff” and her first-race medal. She will return to Sugarloaf from Idaho with her daughter and grandson. Ted Hawkins of Portland, who was described as “a daredevil, black-garbed bullet” in winning the first Schuss by 3 1/2 seconds, says he looks forward to seeing old friends. He admits he no longer skis so fast. Stub Taylor says recalls teasing Paul Schipper, who had a 20-year streak of skiing every day at Sugarloaf. Taylor hasn’t done the math, but believes he probably has more runs on the mountain than Schipper. Bass, who was the ski club’s second president, again will be the race starter. He said the starting technology is different from 48 years ago, but not all that much. “Although racing has changed to counting one hundredths of a second,” Bass said, “it’s still the same idea.